Dimensions 0.75 by 7.25 by 10 in. 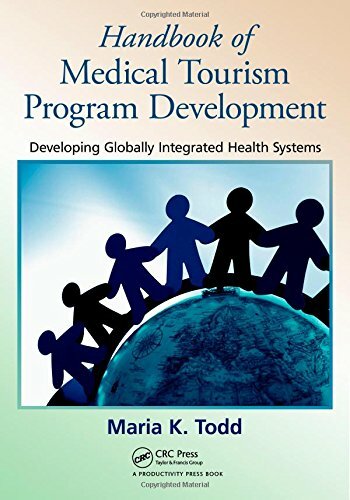 Explaining how to develop a patient-centered medical tourism program, the Handbook of Medical Tourism Development is the ideal guide for any hospital, clinic, hotel, spa, or ancillary facility wishing to become a medical tourism provider. From high-cost surgery, transplants, diagnostics, and preventive wellness checkups, to medical and wellness spa retreats, patient follow up, and outcomes measurement, this book covers the gamut of related issues. Maria K. Todd prepares readers to build the medical tourism service line, integrate physicians and other service providers, develop a safe and effective quality and patient-centered infrastructure, document processes and workflows, determine pricing, evaluate reimbursement contracts, and measure outcomes. She offers useful nuts-and-bolts guidance on confidentiality, documentation, quality and safety, hospital accreditation schemes, revenue implications, and contracting. Sharing time-tested insights, the book will help readers avoid common pitfalls when working with U.S. and international health insurance companies, case managers, professional facilitators, and multinational employers. About: Explaining how to develop a patient-centered medical tourism program, the Handbook of Medical Tourism Development is the ideal guide for any hospital, clinic, hotel, spa, or ancillary facility wishing to become a medical tourism provider.